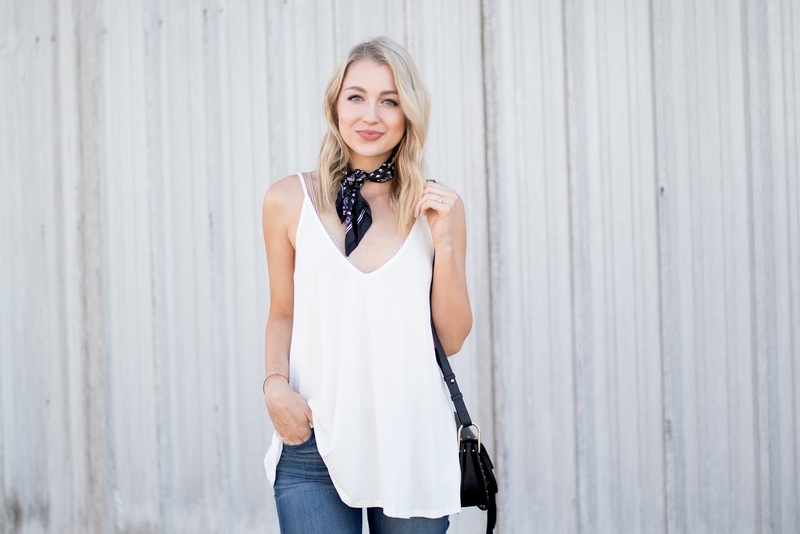 While I was a slow adopter to the trend, I am now totally in love with neck scarves! They add such pizazz to an outfit...making it edgier, chicer and more styled all at once. I've experimented with several ways to wear them (so cute tied on a bag or in your hair!) 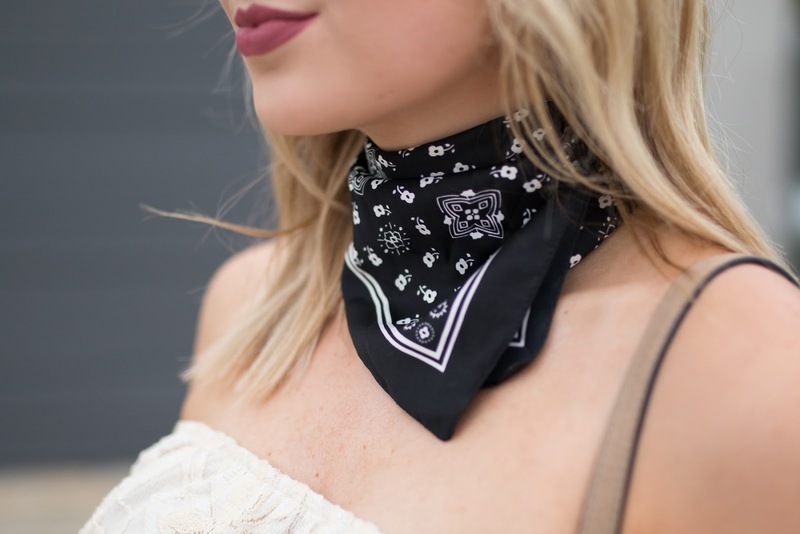 but today I'm focusing on 3 ways to wear a little square scarf or bandana as a neck scarf. This is the first way I ever wore my neck scarf and it's what I see most commonly in the fashion world. It's classic but edgy at the same time. You'll want to fold your scarf in half (into a triangle) then fold it up. The key is to tie is loosely so that it hangs nicely! Full blog posts: simple black dress // white tank top. This one is pretty self-explanatory and only works with certain outfits, but I think it's a great way to add a bit of unexpected edge to your look. In the look above I wanted to make a sweet lace romper a little more fashion forward. You can view that blog post here. In the photo above my neck scarf unraveled a bit as I was shooting, which I didn't realize until I loaded them on my computer, but hopefully you can still get the general vibe. I folded it up the same way that I do with the neck-tie styling, but instead I tied it in the back, and made it a little tighter so that it resembled a choker. Super chic and fun, yes? The full blog post for this look is coming this week! 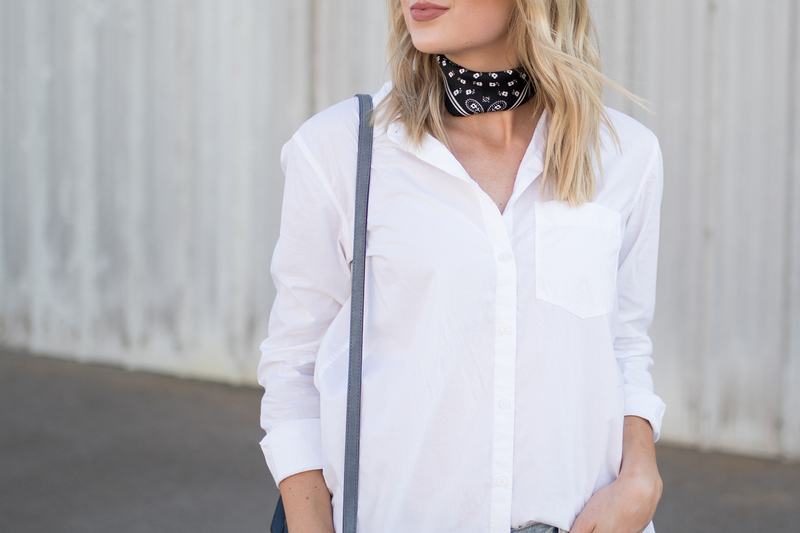 What are your thoughts on the neck scarf trend? Chic or oh-so-weird? I've included some of my favorites from around the web for you below! The one I'm wearing in these pics is sold out from Zara, but I recently ordered this one (in orange) so you should see it added into the mix very soon.